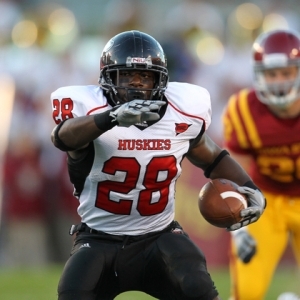 Northern Illinois brings their 10-3 record from the MAC to Boise’s smurf turf to face 8-4 Fresno State in the Humanitarian Bowl. The game kicks of a 5:30 p.m. EST on Saturday, Dec. 18. The two teams haven’t played each other since 1991, so there is no meaningful past history to rely on. The big story in this game is coaching - or rather Northern Illinois’ shocking lack of it. After the Huskies lost in the MAC Championship Game, Jerry Kill took the head coaching job at Minnesota and won’t be coaching the bowl game. That’s bad enough, but he has also taken his offensive and defensive coordinators with him. The linebackers coach is taking over head coaching duties - before he likely follows Kill after the bowl game. Things are so bleak that the school has resorted to bringing back a couple of former players to help with coaching. Needless to say, the situation is far from ideal. Given that Fresno State’s Pat Hill is such a strong coach the mismatch here on the sidelines is extreme. The Huskies don’t have a coach, but they do have a heck of a running game. Senior Chad Spann amassed 1,293 yards for his second straight 100-yard season, and he scored 20 times as well. He was held scoreless just twice all year. Spann runs behind a strong offensive line and that unit will have to have a big game - Fresno State’s best quality is their defensive line; led by senior DE Chris Carter and junior DT Logan Harrell the D-line has made for some rough days for a lot of opposing offensive lines and quarterbacks. Whichever team wins the battle of these behemoth lines is going to have a very good chance of coming out on top in the end. Turnovers could be a major factor in the outcome of this game. Northern Illinois does a great job of protecting the ball. In 13 games they turned it over just 14 times, and forced 10 more turnovers from their opponents. That’s the 18th best turnover margin in the country. Fresno State also had a turnover margin of 10, but unfortunately it was negative - they turned it over 23 times, and forced just 13. Fresno State has to have an uncharacteristically strong day on this front. The biggest thing the Bulldogs need to remember is that bowl games are four quarters long. The last two years - both times in the New Mexico Bowl - they have looked strong early on and opened up a solid lead only to throw it away in the fourth and come out with two losses. Northern Illinois opened as three point favorites, according to college football odds, but have since fallen widely to one, and can even be found at +1 at some betting shops. A small majority of bets made have been on Fresno State. The total opened at 60, and can be found as low as 58.5. Northern Illinois is 9-1-1 ATS in their last 11 games, but just 2-9 ATS in their last 11 against teams with winning records. Fresno State is 5-2 ATS in their last seven nonconference games. On paper I like the Huskies. I would certainly be on them if Jerry Kill were still around. The coaching upheaval is a whole lot for a team to overcome, though - too much. That makes Fresno State look attractive as small underdogs. I’d be especially happy to take them at +3,, which you can find in some places as I write this.